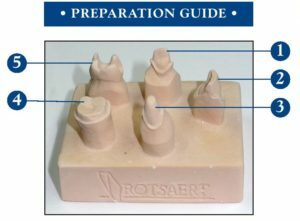 Guide for Tooth Preparation Design | Rotsaert Dental Laboratory Services Inc.
•Uniform reduction results in optimum ceramic strength. •Adequate reduction leads to better aesthetics. •Smooth edges result in lower stress. •Lower stress decreases the potential for fracture. 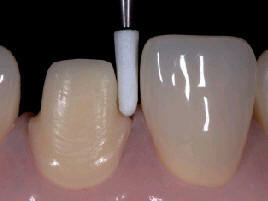 •Ceramic restorations require a passive fit. •Scanners read smooth preparations more accurately. •Circular shoulder preparation with rounded inner edges or chamfer with a width of approximately 1mm. •Avoid sharp edges and angles. •Make sure to observe minimum layer thicknesses (for the stability of the restoration). Today we are discussing Preparation Guides that could help or refresh your knowledge of tooth preparations. For Anterior Crowns, first reduce the anatomical shape and observe the stipulated minimum thickness. Prepare a shoulder with rounded inner edges or a deep chamfer. The width of the shoulder/chamfer should be at least 1mm. Reduce the incisal by approximately 1.5mm. Also, reduce the facial and/or lingual area by approximately 1.2mm. Lastly, for convention and/or self-adhesive cementation, the preparation must demonstrate retentive surfaces and sufficient preparation height. When prepping for Veneers, if possible, the preparation should be located in the enamel. The incisal preparation margins should not be located in the area of static or dynamic contacts. Reduce the cervical and/or labial area by 0.6 mm and the incisal edge by 0.7mm. In the preparation for a Posterior Crown, first reduce the anatomical shape and observe the stipulated minimum thickness. Prepare a shoulder with rounded inner edges or deep chamfer. The width of the circular shoulder/chamfer should be at least 1.0mm. Reduce the occlusal by approximately 1.5mm and also reduce the buccal and/or lingual area by approximately 1.5mm. When preparing for a Table Top, first reduce the anatomical shape and observe the stipulated minimum thickness. Prepare a shoulder with rounded inner edges or a deep chamfer. The width of the shoulder/chamfer should be at least 1.0mm. Lastly, reduce the occlusion by approximately 1.0mm. Static and dynamic occlusal contacts must be taken into consideration. The prep margins must not be located on centric occlusal contacts. A preparation depth of at least 1.0mm and an isthmus width of at least 1.0mm must be observed in the fissure area. Prepare the proximal box with slightly diverging walls and observe an angle of 100 degrees to 120 degrees between the proximal cavity walls and the prospective proximal Onlay surfaces. For Onlays with pronounced convex cavity walls without adequate support by the proximal shoulder, marginal ridge contacts should be avoided. Round out the internal edges to prevent stress concentration within the ceramic material. At the end, do not prepare slice-cuts/bevels or feather edges. Provide at least 1.0mm of occlusal clearance.